...in a far-flung corner of a magical world. This morning we started to get ready for the next phase of the site works. Last week, we had a team from SGO working on the markout of the site for the contractors. And, hopefully, by now we should have some of the plant and equipment arriving on the site. So today is the day that our build team arrives. 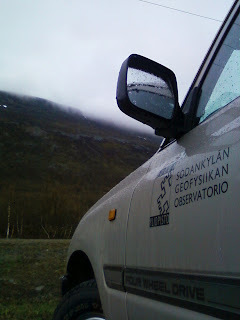 And, as we went to leave the Kilpisjärvi Biological Research Station (which is where we are staying), it was certainly lovely and grey, with some nice rain hammering down (I don't see why wet weather is always portrayed so negatively!). The summit of Saana mountain was obscured from view by cloud. The bulk of the snow has gone from the valleys. Only a few scattered patches remains. The lake still has a lot of ice in it, but it has broken up completely and is melting away in the slowly warming waters. Time to go to site. These next few months are going to be very busy. Like the work during the snow testing (leading up to the destructive test of the HBA tile), we intend to post several times a day with the latest news, photographs and progress.